as He loves those around us. Jesus laid down His life, paying the ultimate price of redemption, and He may call us to do likewise. We are part of God’s plan for reaching the world; we live out God’s plan by His love and His enabling. Jesus said, “Love your enemies,” but this challenges us in two ways: first, how can we love people we regard as enemies and, second, how can we love those who regard us as enemies? If we see them as enemies, perhaps we need to examine our intentions to be sure that we have the correct understanding. If they see us as enemies, we still must examine ourselves to be sure that we have not caused the problem. In either case, a proper understanding of God’s love for them and for us is the best starting point for loving our enemies. This becomes possible as we begin to understand the magnitude of God’s love for us. He loved us when we were yet His enemies (see Romans 5:6–10), and certainly well before we held Him in any esteem. Digging deeper, we realize that God expects us to love those around us with His love, impossible though that may seem. Deeper still, this requires a changed life, a life driven by the indwelling Holy Spirit rather than by our self-interested aims and perspectives. To make this possible, God is transforming us into the image of Christ. With His love driving our thoughts and feelings, we can begin to emulate the mercy of Christ’s plea from the cross, asking the Father to forgive those who crucified Him, just as Stephen emulated his Lord when he asked for forgiveness for those who were stoning him. Saturated and motivated by God’s love, we strive to show Christ to those who oppose the Lord, His message, and us. As Scripture says in 1 John 4:19, “We love because He first loved us.” The more we understand the completely undeserved mercy, love, and grace that God has given us in Christ, the more He enables us to see those around us through His eyes. This includes those who oppose us and even those who persecute us. As our will and identity become aligned with the will and identity of Jesus Christ, as we become conformed to His image, we begin to participate in His sufferings. This suffering may be part of our situation as we work in ministry for salvation or, taking perhaps a larger view, it may be suffering on behalf of the Body of Christ, the Church. Such suffering is not happenstance; God uses it to build our strength and tenacity, much as a smith heats and hammers metal to forge it into a strong, tough new tool. And we are indeed His tools for ministry. God also uses suffering to knock off our rough edges and polish us to better shine with the beauty of Christ, much as a craftsman tumbles precious stones for weeks in a mix of abrasive grit to knock off rough edges, polish their appearance, and bring out their God-given beauty. Tumbling and polishing precious stones is a very slow process, and there are no shortcuts. Indeed, Scripture assures us that God uses suffering to produce endurance, endurance to produce character, character to produce hope, and hope to point us to God’s love. He is remaking us, making us more Christlike! But this is not for our glory, it is for the glory of Christ, as He uses us to reach and save our neighbors. 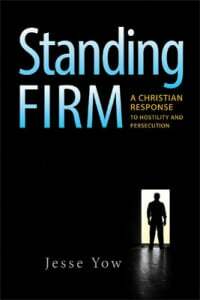 Excerpt from Standing Firm: A Christian Response to Hostility and Persecution, pp. 101-03 © 2015 Jesse Yow, published by Concordia Publishing House. All rights reserved.